Choose a range of strawberry varieties and you could be picking fruits from late spring all the way through to early autumnl. Start with variety described as ‘early-season’, followed by a mid-season type, before completing harvest with a late-season strawberry. Our Garden Planner is a great tool to help you choose the best strawberries for your situation. Double-click on the strawberry icon on the selection bar to pull up the varieties box, then scroll through the drop-down list to select a variety. You can also click the plus button and hover over the information buttons for catalogue descriptions. You even add your own variety, complete with customised spacing and dates. 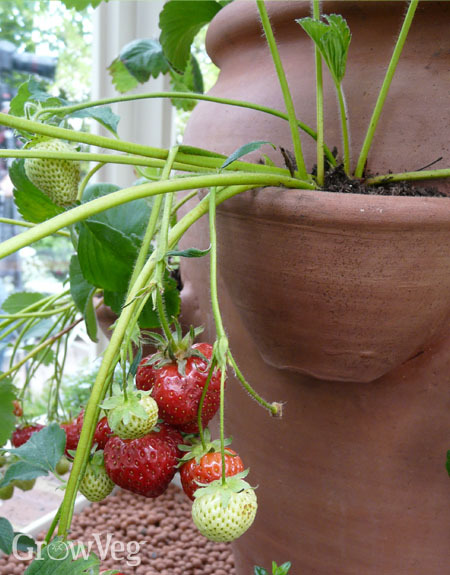 For an extra-early harvest of strawberries, simply cover early varieties with a cloche, horticultural fleece or a polythene tunnel from the end of winter. Once the plants come into flower, remove the covers on warm days to allow insect pollinators access. 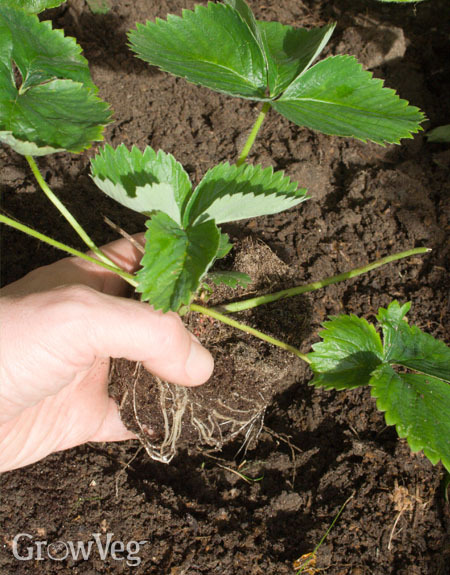 Forcing strawberries in this way will give a crop up to three weeks earlier. Maximise your harvest by using an organic liquid fertiliser that’s high in fruit-promoting potassium. As soon as the first flowers appear, start watering your diluted liquid fertiliser on regularly, at least every two weeks until they’ve finished fruiting. Natural plant fertilisers such as comfrey tea are ideal, or opt for a liquid tomato fertiliser as an alternative. Ah – the moment of truth! Pick your fruits as soon as they’ve turned red. Enjoy them as soon as possible after picking. You can use a refrigerator to store the fruits, but this does impair the flavour and aroma of the fruits. Once the plants have finished fruiting, the foliage can be cut back to leave just the young, central leaves intact. Remove any straw mulch and add it to your compost heap.